A couple of weekends ago a group of members from the Oklahoma Longbowman and the Oklahoma Selfbow Society got together for a members hunt near Kaw Lake up in the northern part of the state. Thankfully the Ponca City Bowman club opened up their grounds for us to have a place to stay and to fellowship. Saturday morning my two sons and I went in to scout and to find three or four places to set up brush blinds. We scouted along a creek bed on the N side of Kaw Lake and along the edges on three soybean fields. After building 4 set ups we headed back to camp for some lunch and to see what everyone else had seen or done that morning. Sightings were reported back at camp and deer and hogs were on everyone's mind when we all headed back into the woods that afternoon. I let my two boys each pick where they wanted to go and as my good fortune would have it I got to sit the closest to the truck, which was nearly a mile away. They choose to go in further to the other set ups we had made earlier in the day. My oldest son, Matt, reported that he had a hog feeding about 60 yards out from his set up and was very excited as a hog has been on his wish list for at least 3 years now. The hog never did get close enough for him to get a shot but he had a great hunt nonetheless. Josh, my younger son, was set up at the edge of a soybean field sitting just inside the wood line with a round bale of hay helping to conceal him. He had a small 5 or 6 pointer within 30 yards and had decided to wait for a larger adult doe that was feeding too far out to get closer. 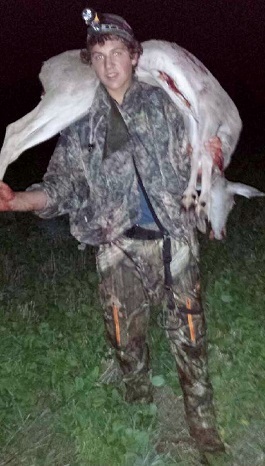 This was his first time to bowhunt deer and I am proud of him for passing on the young buck. At my set up I was hiding inside the wood line and had a small road that made a cut through the wood line which allowed a tractor to get from one field to the next just 10 yards to my left. After sitting for 5 or 10 minutes I watched as three does fed down the wood line towards my set up. With much excitement I watched them go into the woods and back out into the soybeans as they fed to within 30 yards of me. If my plan worked out and they decided to walk through the cut in the woods on the road to my left I would be down wind of them at 10-12 yards. I readied my 44 lb Lonetree Archery longbow and waited for the perfect shot. The largest of the three was nervous about something upwind and kept going back into the woods and finally out of my range as she was trying to figure out what was back behind us. The other two does decided to follow my plan and was slowly taking the road which was going to lead them right into my shooting lane. I really did not want to shoot the smallest doe figuring she was a yearling, but had decided I would take either the larger doe or the second largest as she looked like a dry doe without a yearling. This second from the largest doe decided to feed back into the woods off from the road but not the way the larger doe went but right towards me! I am kneeling on the ground, in my bush in a bag leafy suit with a large oak tree right behind me and this doe looked right through me 3 or 4 times. I am surprised she did not hear my heart beating as she fed to within 8 yards of me. Right before she would have taken 3 or 4 more steps into the woods and could have winded me she turned her head back over her shoulder to see where the other two deer were which allowed me to slowly raise my bow and draw and then release when she turned back broadside. My 2040 Predator arrow tipped with a 125 grain Woodsman broadhead found its mark and zipped nearly through her. When she ran out of my view I could only see my fletchings hanging out low in her chest behind her front shoulder. I heard her crash in the woods withing 30 seconds of my shot! I sent a text to Matt and told him I had shot a doe. I told him that he and Josh could hunt until shooting light faded, which was another 30-45 minutes, but he was too excited for me to hunt and offered to get his brother and to come help me do the work on the doe. 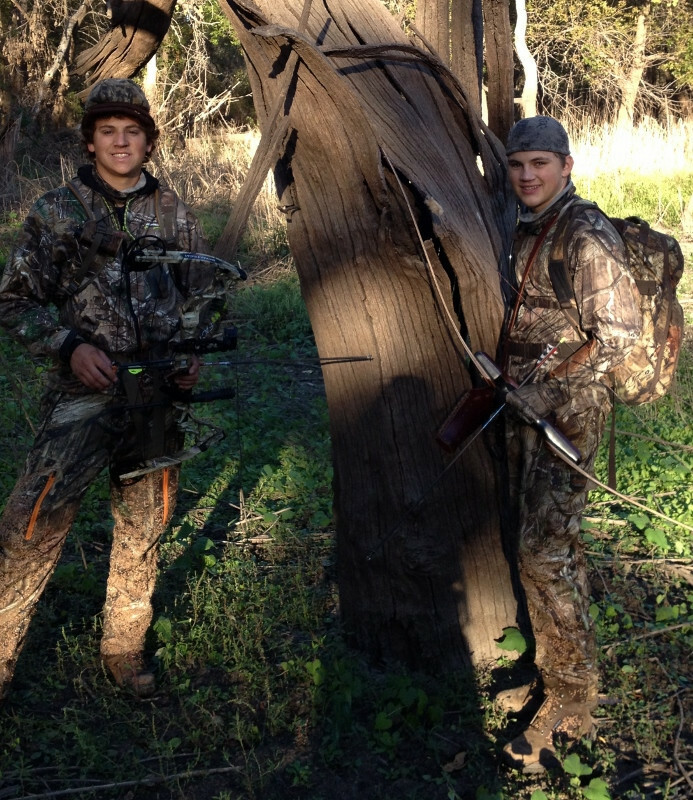 I am blessed to have two sons that love to bowhunt and that don't shy away from hard work. I am waiting for a knee surgery and although it only slows me down and HURTS all the darn time I am able to get out and enjoy the hunt with my sons. I had a pack frame and game bag back at the truck and offered to go get it while they boned out the meat, but they refused to let me walk all the way out to the truck and back in to where they were field dressing her. Since they were the ones doing all the work I offered to carry their bows and backpacks while they took turns helping dad get his deer back to the truck. When we got back to camp a couple of the guys looked at the does jawbone and aged her at 5-6 years old. She sure was some good eating! Once I can remember how to upload a few pictures I'll share those on here. good job. and a well told story. Josh helping with a big smile on his face! 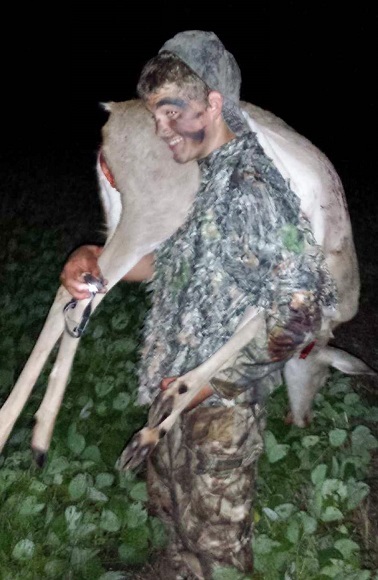 And Matt helping the old man get the doe to the truck. Great times with family and memories I hope the boys and I never forget! One last shot of the boys Sunday morning before we had to head back home. Thanks for coming sharing in our hunt! Great hunts are always better when you can share them with family. Congrats on the doe. That is "off the charts" in so many respects sir. Good on you for your relationship with your boys! Good on your boys for their relationship with their dad and man what a thrill to get that doe on the ground! Great shot! All of Creation Gives God Glory! Way to go KC! I sure wish I would have been there instead of working-someone has to keep the lights on. 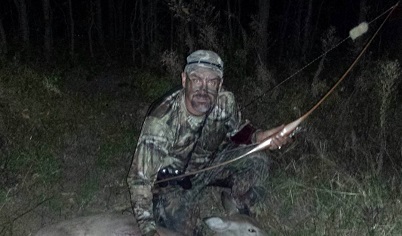 Congratulations on the doe and the hunt with the guys. Good Stuff right there! Congrats! Very Nice! Congrats on the success!!!! Morrison Shawnee, Longbow Limbs- 47.5# @ 28 1/2", 45.5# @ 28 1/2"
Toelke Whip- 52# @ 28 1/2"
Damon Howatt Hunter- 45# @ 28"